Sarah Nutter, the current dean of the school of business at George Mason University, will take the helm of the University of Oregon’s Charles H. Lundquist College of Business on Jan. 17. In her new role, Nutter will lead a college that was founded in 1914 and today enrolls more than 5,000 students in a variety of undergraduate and graduate programs, including accounting, finance, sustainable business practices, entrepreneurship and sports marketing. 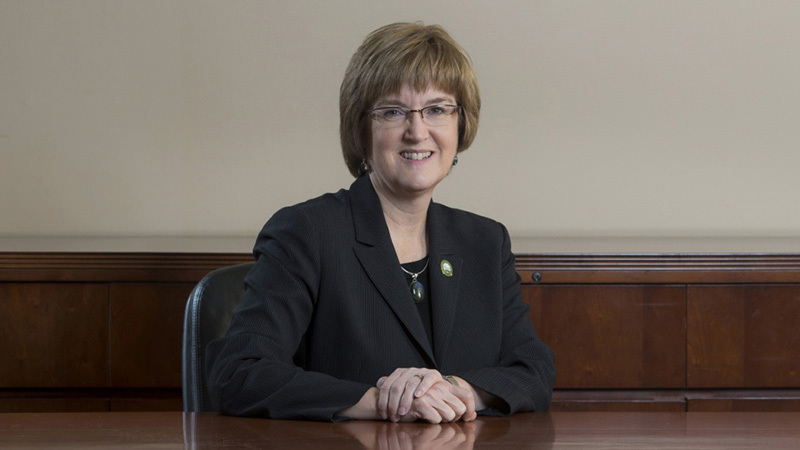 Nutter has served as dean at George Mason since 2013. After earning her doctorate in accounting from Michigan State University, Nutter joined the faculty at George Mason in 1995. She is a senior scholar in the Mercatus Center at George Mason and has served as chair of the accounting department and director of the business school’s executive MBA program. In addition she was a presidential fellow with responsibility for campuswide initiatives. In addition to Nutter’s inclusive approach in working with internal constituents, the dean and professor of accounting also transformed the advisory boards and councils for the business school by enlisting a 200-strong group of executives and business professionals to help guide the college. “We want to express great appreciation to Bruce Blonigen, who has been serving as interim dean for the last several months, while also chairing this critical search,” Coltrane said. “I would also like to again thank James Terborg for his service as interim dean in the year prior. Their efforts have gone above and beyond.